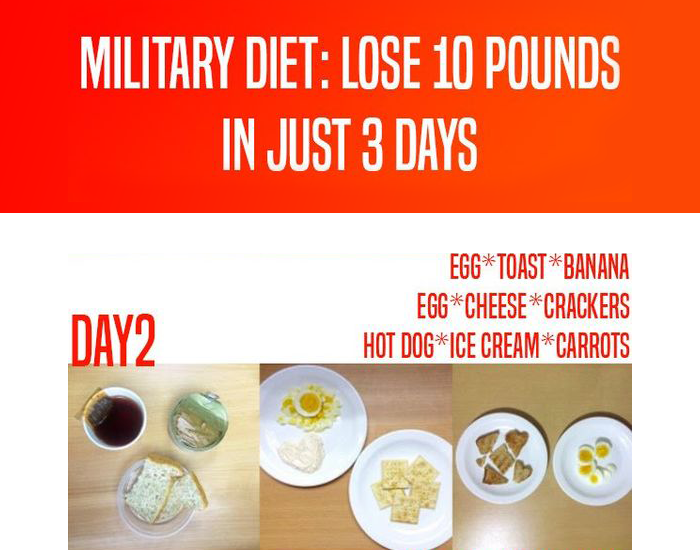 The Military Diet is the new fad amongst weight watchers. It claims to lose weight quickly as much as 10 pounds in a matter of a week. 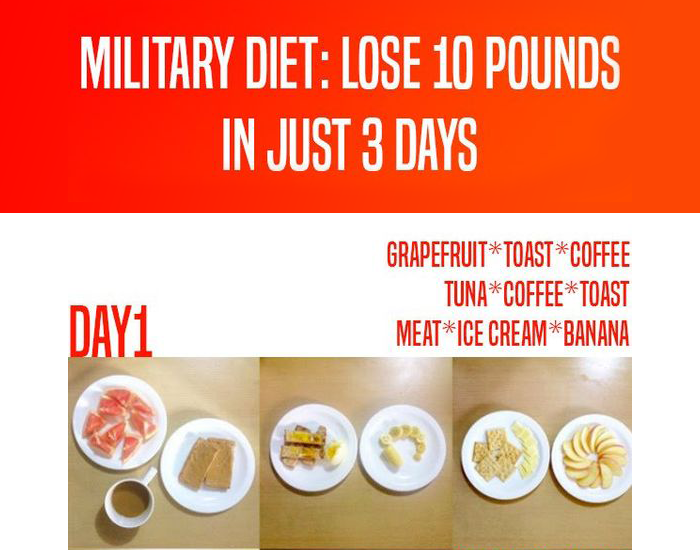 Do not get confused with the name, it is called military diet because it adheres to strict calorie intake for 3 days and eats whatever one likes still in the minimum calorie range prescribed by the diet. 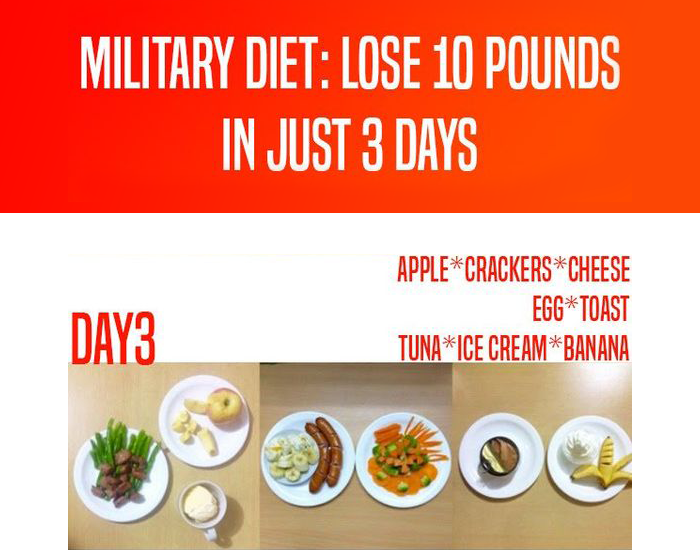 The Military diet is also known as Ice-cream diet (because the diet has vanilla ice-cream), navy diet or army diet. The calorie restriction for 3 days is between 1100 -1400 calories and it is advisable to keep the calories under 1500 for the next 4 days. The reason why the diet works are it drastically limits calorie intake, the body is burning more than it’s taking in, and you’ll shed pounds quickly, possibly even that 10 pounds in one week. However, the diet itself is only designed to last one week. If you're looking to get a jump-start on your weight loss journey, it can be a good place to begin. But if you're looking to make healthy changes in your life, longer-term solutions might be the better fit. Breakfast consists of half a grapefruit, a slice of whole-wheat toast with 2 tablespoons of peanut butter, and a cup of caffeinated black tea or coffee. For lunch, have half a cup of tuna, one slice of whole-wheat toast, and a second cup of black coffee or tea. Dinner is the most filling meal, consisting of 3 oz of meat, one cup of green beans, half a banana, one small apple, and one cup of vanilla ice cream for dessert. For breakfast, have one slice of whole-wheat toast, one egg cooked however you like, and half a banana. Lunch is one cup of cottage cheese, one hard-boiled egg, and saltine crackers. Dinner features two hot dogs, one cup of broccoli, half cup of carrots, half a banana, and one-half cup of vanilla ice cream. Breakfast is a slice of cheddar cheese, a small apple, and five saltine crackers. For lunch, have one slice of whole-wheat toast and an egg cooked however you'd like. When dinner rolls around, you can have a cup of tuna, half a banana, and a full cup of vanilla ice cream. The takeaway from the diet is it can be tried for a week if there is some big event coming up but should not be used as an alternative to a healthy lifestyle. It is low in fiber, iron and other important nutrients needed for the body. This is not a diet that one can sustain for the long run so one should always have a healthy approach from the beginning itself.